Gilson Master Control Panel for Triaxial & Permeability Tests - Gilson Co.
Master Control Panel combines precise control, logical layout, and quality components for accuracy and ease of operation for both triaxial shear and flexible-wall permeability testing. 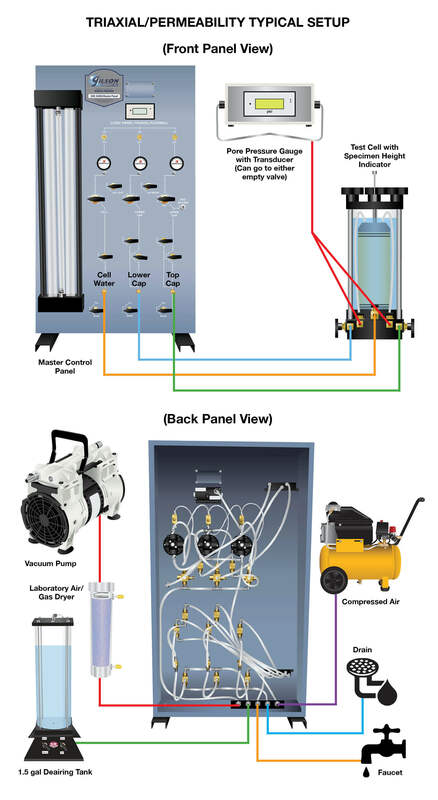 Control Panels for triaxial shear and flexible-wall permeability testing use a system of burettes, valves and regulators to precisely regulate air and fluid pressures in Testing Cells. They provide a central point for supply connections of air, water, and drains with a logical layout and are built with quality components. Controls in the upper half of the panel regulate air pressure to the specimen chamber while the lower controls regulate the water supply. Precision regulators set and control pressures during saturation, consolidation and testing phases, and zero-displacement ball valves are used for positive shutoff. Two 50cc burettes with 0.1cc graduations for flow measurement, and two 4cc pipettes with 0.008cc graduations are included. These are located inside two storage chambers which have additional capacity of 400cc each. The HM-350M master panel includes a factory-installed digital readout for setting test cell and sample pressures in psi units. The digital display of the HM-350MF reads out in kPa units. Effective cell pressure and cell and sample back-pressure are all controlled through a single regulator. This is particularly useful during the saturation phase and causes no change in effective stress. Connections for the test cell and reservoirs are conveniently located on the front to allow easy filling and draining. Main supply connections for water, air and drain are located at the rear of the panel. To control additional Triaxial or Flex-Wall Permeability Test Cells, an HM-350A Auxiliary Panel can be connected to the Master Panel. Up to two Auxiliary Panels can be connected to a single Master Panel. The sturdy powder-coated aluminum frame is 21x6.25x37.25in (533x159x946mm), WxDxH. Accurate measurement of pore pressure for correction and control of loads and loading rates can be accomplished with the optional HMA-521 Digital Pore Pressure Gauge. A transducer is included with this gauge. Other optional accessories include the HMA-506 Specimen Height Indicator to track sample deformation and the HMA-520 Deairing Tank to prepare water for use in the testing chambers. Triaxial and Flexible Wall Permeability Test Cells and other accessories are ordered separately. An air compressor is required to generate confining pressures, but not included.